When you are contemplating home additions or renovations, CM Builders Inc. is the construction company to trust. 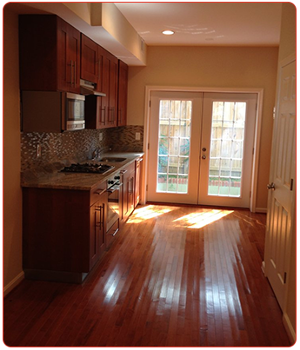 Based in Brentwood, Maryland, we specialize in bathroom and kitchen remodeling. As a licensed contractor for the Environmental Protection Agency, you can rest assured that all of our builds are safe, as well as beautiful. Trust our crew to do the job right. At CM Builders Inc., we stand behind our work, offering a one-year warranty. Let our crew take care of everything as we remodel your home. Getting the proper building permits for heavy renovating can be a difficult task, but we go through the process so you do not have to. We make sure that we have permits for plumbing, HVAC, and electrical work. For those of you who do not already have a design, we are more than happy to make blueprints for you. Everything we do is based on your preferences, and we never move forward with construction until you are completely happy with the changes we are planning. Find a home that is ready for you to move into. For those of you who want to avoid the hassle of building the perfect house, we sell and rent homes that have already been remodeled. As an experienced property flipper, we know how to increase the value of a home while adding curb appeal.